"This sweet and crunchy salad is very kid friendly! I first tried this when I visited my family in Newfoundland, and managed to get a copy of the recipe. Make lots, there won't be any left over. Any kind of lettuce can be used as well as spinach. Raisins can also be added." Place the onion, sugar, mustard, celery seed, and black pepper into a small bowl. Pour in the vinegar, and stir until the sugar has dissolved. Whisk in the olive oil until the dressing is thick. Cover, and refrigerate at least 3 hours. 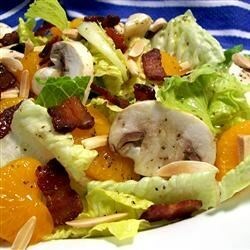 To make the salad, toss the lettuce, oranges, mushrooms, almonds, and bacon together in a large bowl. Drizzle with the dressing, and toss again to coat.